Giới thiệu công nghệ EDI5.00 out of 50 based on 1 voters. EDI is a technology that combines ion exchange resins and ion-selective membranes with direct current to remove ionized species from water. Its development and use in water purification overcame some of the limitations of ion exchange resin beds, particularly the release of ions as the beds exhaust and the associated need to change or regenerate the resins. The ion exchange process efficiently removes ionized species from water by exchanging them for H+ and OH- ions. 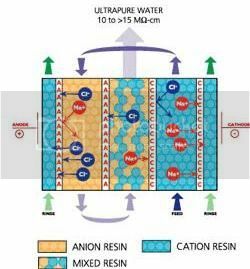 Water passes through one or more chambers filled with ion exchange resins held between cation or anionselective membranes. Ions that become bound to the ion exchange resins migrate to a separate chamber under the influence of an externally applied electric field. This also produces the H+ and OH- ions necessary to maintain the resins in their regenerated state. Ions in the separate chamber are flushed to waste. The ion exchange beds in EDI systems are regenerated continuously, so they do not exhaust in the same way as ion exchange beds that are operated in batch mode.